Different body types create different challenges when it comes to fitness goals. If you’re reading this, you probably fall into the ‘skinny girl’ category. And by skinny girl category, I mean: you’re a hard gainer. Whether it be fat or muscle, it’s hard for your body to gain and even harder for it to hang on to! This makes you, an ectomorph. This body type is characterized as having long, slim limbs and muscle fibers. Scientifically speaking, the revved-up metabolism and greater sympathetic nervous system dominance seen in most ectomorphs, does not make for an ideal muscle (or fat) building environment. Does this mean you’re bound to curve-lessness forever? Absolutely not! But it does mean you will have to work a little smarter for it! In this article, you’ll find some skinny to strong diet and exercise advise, and the perfect skinny girl workout to try out. As an ectomorph of note myself, I have dealt with the ‘skinny girl’ problems first hand! Girlfriend, I hear you! Luckily with clever eating and equally clever training, you CAN achieve that ‘toned, fit look’. A key element in toning that skinny girl booty is your diet. Ectomorphs seem to chew through calories at an accelerated rate. Tracking your calories is a good idea to make sure you are getting enough in each day. Here is an easy way to calculate how many calories you need. Research suggests that ectomorphs are best suited to a diet that is higher in carbohydrates, for example, 50% carbs, 25% protein, 25% fat. In my experience with my own ectomorph-ness and working with clients of this body type, this appears to be a trustworthy suggestion. Eating regularly (every 3 hours or so), choosing complex carbohydrates and nutrient dense snacks, and loading up on green vegetables is a good way to approach your goals of a toned, fit body. In addition to this, making use of a post-workout protein supplement can also be helpful. Ectomorphs naturally excel at endurance type activities. Consequently, they choose cardio over weight-training. However, when it comes to developing that shapely body, ectomorphs respond best to weight-training. Specifically, major muscle group, compound exercises. These exercises are best performed on the lower end of the repetition scale (8 to 12 reps), and with as much weight as safely possible. It’s also a good idea to allow for adequate rest times between exercises, to spend less time in your ‘intense HR zone’. Cardio and high-intensity activities should be kept to a (healthy) minimum to preserve muscle mass and avoid burning unnecessary calories. To help you out, here is a workout that ticks all the ectomorph boxes. This workout is designed to target your major muscle groups and create a strong and shapely body. Of course, this needs to be done in conjunction with a suitable diet for best results! If you have any health concerns, it is important you consult your physician prior to commencing this or any exercise regime. To complete this workout, you will require some dumbbells, barbells, a bench and cable/pull down machine. Beginners how to: Perform all the exercises as shown in the exercise section below for 12 repetitions. The weight you use should be safely manageable for your rep range. If need be, the leg exercises can be done with bodyweight only. Rest for 30 seconds in between each exercise. Complete 2 or 3 rounds. Intermediate/advanced how to: Perform all the exercises as shown in the exercise section below for 10 repetitions. The weight you use should be as heavy as you can safely manage for your rep range. Rest for 45 seconds in between each exercise. Complete 3 or 4 rounds. Warm ups/cool downs: For an ideal warm up, complete a handful of dynamic stretches. To cool down, complete 5 minutes of gentle walking on the treadmill. Static stretching is a great idea 4 to 6 hours after exercise. Instructions: Begin standing with your feet shoulder width apart. Rest a barbell on your back, holding it with an overhand grip. 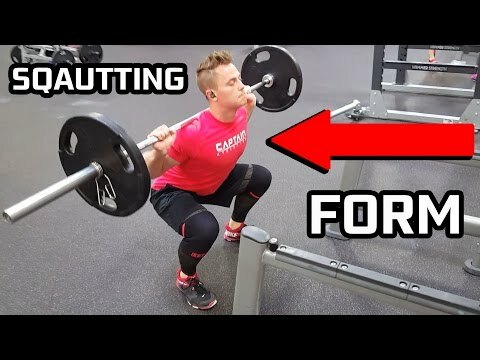 Initiate the squat position through hinging at the hips and bending your knees until your quads are parallel to the ground (depending on your mobility). Lock your hips and squeeze your glutes when you return to standing position. It’s important to keep your core engaged to support a neutral spine and avoid pelvic tilt during your squat. Your knees should not, at any stage, go beyond your toes. A good way to avoid this is by keeping your weight concentrated in your heels. Instructions: Lie on a flat bench holding a barbell with your hands shoulder width apart. 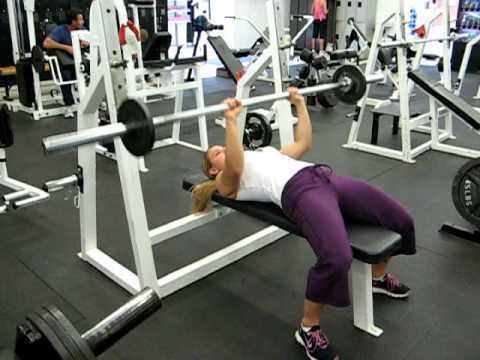 Your eyes should be under the bar, in terms of the positioning of the bench in the rack. Lift the bar off the rack and lower it down to your chest whilst inhaling. Drive your heels into the ground, exhale and push the bar back up. Wrist positioning is an important element of a good bench press. Try to hold the bar with a neutral wrist positioning, rather than flexed back. At the bottom of the lift, your wrists and elbows should line up straight, or close to. 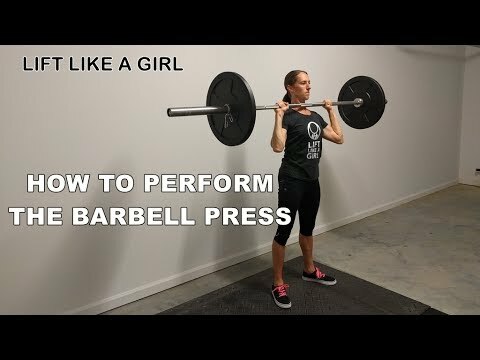 Instructions: Hold a dumbbell in each hand with your arms by your sides. Take a big step forward and bend your knees to lower your hips towards the ground. Keep your chest upright and a maintain a neutral spine. The knee of your back leg should not touch the ground. Push back upwards through the heel of your front foot and take a step forward with the other leg. Focus on stepping out of each lunge with your heel and glutes (bum muscles) rather than your quads (thighs) and toes. This will increase the muscle activity through your posterior chain and boost those booty gains! Note: The repetitions, in this case, refer to each leg. So, 10 reps = 20 walking lunges and 12 reps = 24 walking lunges. Instructions: Sit in the wide grip machine holding the bar with a wide grip. Extend through your thoracic spine and engage through your lats (underarms) then pull the bar down to just above your chest. On the upward phase of the movement, control the bar and ensure that you go to full extension through the arms. When doing this exercise, I like to hold the position at the bottom part of the movement for the count of 2. At this point in the exercise, your back muscles are fully contracted and are working at their hardest. Feel the burn! Instructions: Hold a barbell with a neutral/shoulder width, overhand grip. Before you start the movement, you should be standing with a hip width foot stance, an upright torso, and a slight bend in the knees. From here, without increasing the bend in your knees, lower the barbell down the front of the legs. This is achieved by pushing your hips backwards, keeping a neutral spine. Once you feel a stretch through your hamstrings, pull back up to starting position. Avoid leaning too far back at the top of the movement – standing up to straight will suffice. Instructions: Stand with your feet shoulder width apart, holding a barbell on your chest. Your grip should be over shoulder with apart and your wrists should be comfortable. Keeping your core engaged, push the barbell up overhead. Inhale as you lower the barbell back down to your chest. People tend to push/flex their hips back to help them push the weight up overhead. This shifts a lot of the load from your shoulders to your lower back. Not only does this make the exercise less effective, but it also sets you up for injury. Before pushing the barbell overhead, ensure your core is engaged and your hips are tucked under to protect your lower back. Instructions: Hold a dumbbell between your hands whilst sitting on the ground with knees bent and your ankles crossed. Lift your ankles off the ground so you’re balancing on your tail bone. Avoid rounding your back. Twist through your core to move the dumbbell from the left to right of your body. Try to keep your torso and legs still, whilst you twist through the center of your body. If your legs are whipping from side to side, chances are you’re twisting with momentum rather than using your abdominal muscles. Note: The repetitions, in this case, refer to each side. So, 10 reps = 20 Russian twists and 12 reps = 24 Russian twists. I hope you now feel better equipped to transform your body from skinny to strong! Understanding your body type is a crucial step in making changes to it. All body types come with their own unique set of pros and cons, and it goes without saying that we all want what we don’t have. Regardless of what body type you were blessed with, determination and dedication to the fit girl lifestyle is necessary to reach any serious fitness goals. The consistent work that goes into a toned, athletic physique is not to be underestimated.